NES Castlevania II: Simon's Quest (USA) in 29:45.02 by zggzdydp. If science fiction is to be believed, the ultimate evolution for biological beings is to discard the physical body and become an entity of pure energy. For video game characters, it seems to be the ability to zip through walls. In this latest TAS by zggzdydp, Simon Belmont joins the league of characters possessing this ability. Castlevania II: Simon's Quest is the story of Simon's horrible weekend without sleep. Two years after defeating Dracula, the hero is physically weakened by Dracula's curse. 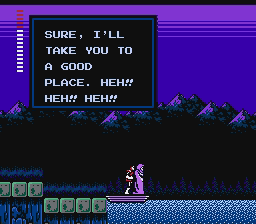 He must gather Dracula's remains and incinerate them at the ruins of Castlevania in order to end the curse. This movie is 2 minutes and 23 seconds faster than the previous effort by the same author. We recommend to read his comments for explanations on how this improvement was achieved.